Ingredients: Water (Aqua), Glycerin, Yeast Extract, Sodium Hyaluronate, Hyaluronic Acid, Ceramide NP, Ceramide AP, Ceramide EOP, Phytosphingosine, Adenosine, Cholesterol, Panthenol, Silanetriol, Butylene Glycol, Sodium Lauroyl Lactylate, Carbomer, Xanthan Gum, Polysorbate 20, Phenoxyethanol, Ethylhexylglycerin. 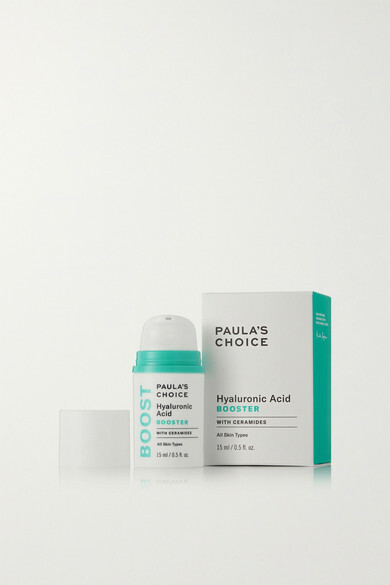 Paula's Choice's 'Hyaluronic Acid Booster' is formulated to moisturize and plump your skin. Lightweight and gel-like in texture, it contains reparative Ceramides that work to smooth and fill in fine lines and wrinkles, while Panthenol keeps moisture sealed in. Use it every day to achieve a youthful glow.